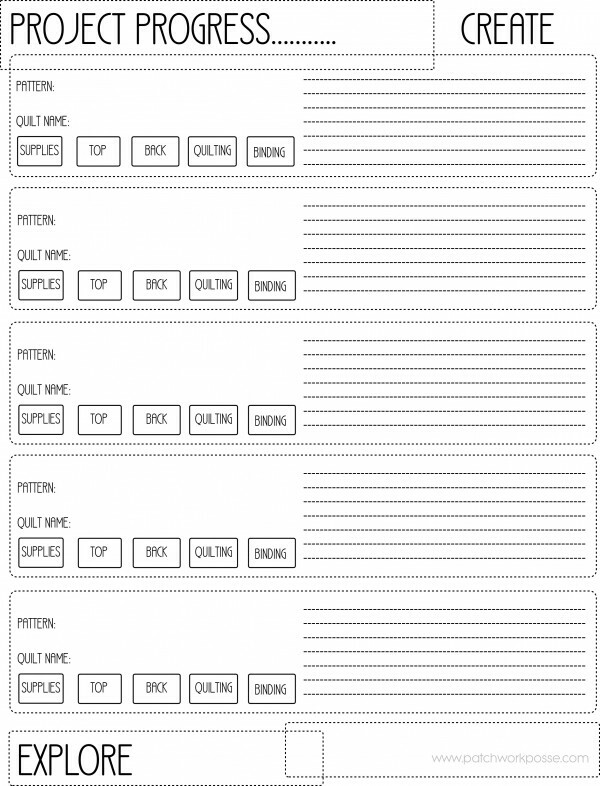 Part of keeping your sewing studio organized is keeping track of where you are at on quilt projects and other sewing projects. They can quickly become a mess with little bits here and there and in the end you’ve written down so many notes on stickies and other scratch paper that to find them is impossible so you start winging it. Here’s a quick little quilt project printable. top – you’ve sewn the top together! quilting – is it done? binding – last step in the progress. Marking this means it’s finished! There are additional lines on the right for making notes. You can write your fabric you are using, what fabric the binding is, maybe the spot where you are hiding the pattern, ideas that you might have on the quilting design. Any kind of notes like that…. 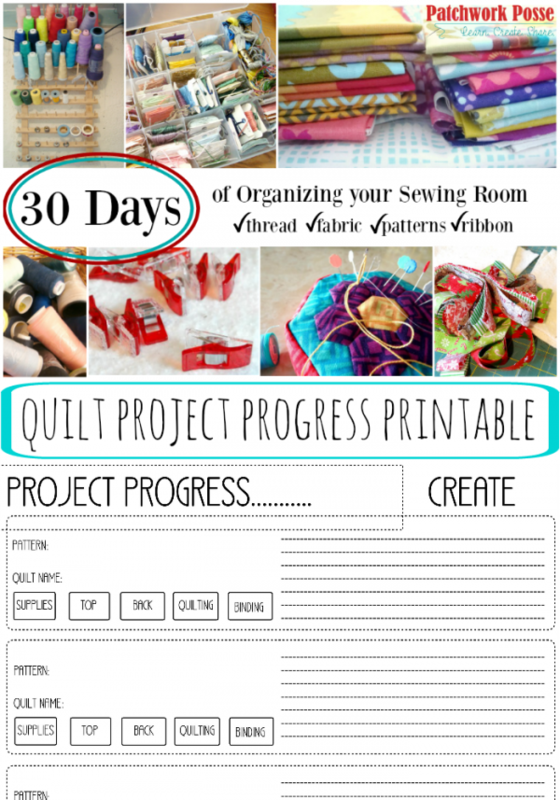 you know whatever you need to keep track of your quilt progress. In each section is also a spot for writing the pattern name, because we forget and then when someone asks us what it’s about we can actually tell them. And the quilt name. What are you calling this quilt? Now, to make this work even better, I would hang or post this on a wall in your sewing room. Keep it out in the open and handy. That way you can keep track of what projects you are working on right now and feel good that something is being done and you are on schedule…if there is one. Have fun! Feel free to share with others. What kind of things would you like to see on another project tracker? This is part of the 30 days of organizing series. Visit here for more quilting printables. Don’t forget the ‘design’ phase! Even if you make it exactly to pattern, unless you’ve purchased a fabric kit, you’re making colour and fabric choices. And so many of us ‘tinker’ with the patterns. ‘Oh, I love this throw, but I want to make it big enough for a twin bed, so I’ll need to add another row and a border’ or ‘I’m going to replace that Sunbonnet Sue with a Superhero Sue’. And then there is designing a quilt from scratch, but I’m too much of a beginner to imagine that yet!